Castle Comfort Stairlifts – London have decades of experience in the lift and mobility market and can help you with whatever your need, and whatever your steps look like. We are here to advise you as you are researching the best London stairlifts for your needs. Trust us to get you the right lift and at the right price to suit your budget. All residential stairlifts can be sourced through our London office although we do work with partners who can also cover DDA compliant commercial installations. 1 Who can be helped by stairlifts? 3 How do I find the right stairlifts for me? Who can be helped by stairlifts? We started this business helping our own families with their stairlifts. Now we can do the same to help you. If you, or someone you love, is finding that climbing or coming down stairs is becoming difficult, WE can help you if you live anywhere in the London and South East area. The reasons why stairlifts could be a recommended purchase for you now, could be down to medical reasons, general old age or because your stairs are too steep or angled for you to manage safely. Some of the commonest physical reasons we have helped previous customers with are some of the many different forms of arthritis, Parkinson’s Disease, Motor Neurone Disease, pulmonary or cardio-vascular complaints, joint replacements or broken bones. Some customers families may have a dependent relative who is too heavy to climb stairs easily, such as with those who are obese. In these cases a heavy duty stairlift can be specified which can be rated up to 31.5 stones. In this way the hardest steps of the house become a gentle and easy glide to bed or the bathroom upstairs. Some clients are just more frail when they become elderly and so for these people climbing up or bearing their full weight on their knees or ankles when they descend the staircase is simply too much of an exertion for them and so to make life less of a struggle a stairlift would be chosen to suit their stairs. Sometimes the staircase is not wide enough for them to negotiate safely as the stairs may be steep and turn too sharply. In this case a survey specifically to suit stairlifts for narrow stairs will be the order of the day. Last of all we often have partners of a dependent spouse who may have had a stroke or a cognitive impairment that stops them being able to manage the staircase in a safe manner. For instance some people with dementia may forget how to climb the stairs or be unsteady on them, whereas a person who has had a stroke may have a good arm or leg and a lack of movement, feeling or strength in the other – which obviously makes it difficult to traverse the stairs. For those with dementia or Alzheimer’s the transitioning steps to and from a wheelchair, with assistance, can be managed at either end of a set of stairs. A secure seat belt so that the rider won’t slip off the seat makes the process trouble-free. In this way the individual is still being cared for in their own comfortable environment that they know and are familiar with, which is much better for everyone concerned. Perhaps you are interested in finding out what it might cost you or a relative or friend of yours? We can certainly help there. If your need is urgent, as might be the case for a hospital discharge, then contact us directly on 020 7717 9797 and we can give you an approximate budget to be looking at, so then if you agree to proceed we can flag your installation as a priority one and endeavor to install it the very next day. Costs for stairlifts across London and the Home Counties can be gauged by calling us or texting a few pictures of your staircase to our mobile number. Phone us on the landline for details. This approximate costing is a very rough idea but there are a number of factors that influence the price including which stairlifts model would suit the rider, the actual stair case layout, and whether any optional extra’s are required, such as a powered swivel seat or retracting/hinged track, which obviously add to the costs a little. We can arrange for a quick quotation from up to four different suppliers, so that you can have a thorough stairlifts comparison with related pricings to be able to make up your mind on which one might suit you. Do take into account the warranty period of the stair lift as the chair lifts manufacturers do not have the same minimum standard for the warranty length. So make sure that you are comparing like for like. We can help you along with this if you are unsure – just give us a call on 020 7717 9797 and we can point out what to be aware of and some useful advice gathered from our two decades of experience in the business. How do I find the right stairlifts for me? 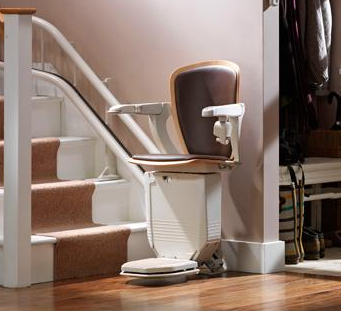 Whichever layout your staircase has, you are hopefully realising that a stairlift may well be the device you need – which will ensure safety on the stairs today and also on into later years. The next question becomes how do we go about finding the right one? Beginning online, like you have done, is a good start to get an overview of the marketplace and see who the popular companies are. A hint to look for is to see if they have some customer reviews. Have a look to see if there are reviews for the stairlifts company and that they are favourable. Then they will be a good first port of call to consider. 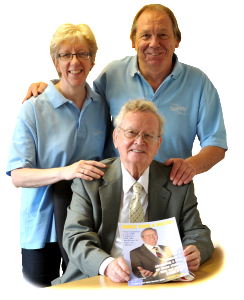 We have helped many people over the years that we have been in the stairlifts and mobility business and over that time we have received a great deal of positive testimonials and reviews for our service to families. Shopping for a stairlift, or chairlift as they can also be called, can be a burden as there are many different brands to choose from, available in lots of different configurations. We can make the whole process simple, straight forward and stress free. SAVE THOSE KNEES – CLIMB STAIRS WITH EASE! We have supplied all the main British-built stairlift companies lifts and are also in regular contact with smaller family suppliers throughout London and the Home Counties. The right supplier can perhaps get you a bargain chairlift, if you were prepared to consider pre-owned models, rather than buying a new one. For straight stair lifts it can often be better to go for a new model because the price difference between used and brand new isn’t much. For a curved stair lift the price difference between new and second-hand may be up to £1,000 cheaper, so that could be an option for you if you were willing to go down that route. Hiring a lift on a very short-term basis is possible, but it is not always economical. There are costs for installing the stairlift, then rental fees per week or month, then removal fees when the stair lift is taken out. These all add up such that some people assume that it would be cheaper to rent one than buy one. Examples such as if the need is for a week or two and would not be needed again might work out a viable option, but the installation of a reconditioned lift might work out cheaper in the long run than paying to hire a stair lift over a period of a few months. Why not contact us to discuss your situation and we will be able to advise you with no obligation. The number to call is 020 7717 9797 and we are available anytime to help. Now you will be able to proceed with confidence, knowing you have an experienced adviser to the whole marketplace, that can get you the best offers on buying new, sourcing a repair or answering questions about warranties. Call us today, you’ll be glad you did! If you would rather email us you can do that here or go to our contact form at your convenience.